I love camping in the fall. Do you? I love the smell of wood burning in a campfire, roasting hot dogs and marshmallows over an open fire, making S'mores, and telling ghost stories around the campfire. Awakening to the cool crisp morning air after sleeping in a tent is so refreshing. 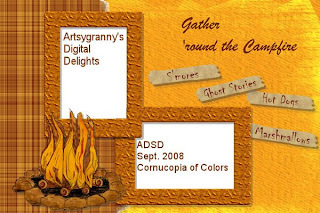 As you know, I took part in the September Collaboration at ADSD - Cornucopia of Colors. I have some elements in my portion that are just right for your camping layouts. I thought I would make a little treat for you to get you started using your kits you are downloading. Here is a brag book page using my portion of the kit. If you haven't jumped on board the blog train to pick up the fabulous designs offered by the designers, now is the time to do it. A list of the designers and links to their blogs can be found below this post Have fun! For those of you that took the time to post a comment on the 4shared site and here on the blog, I thank you. I read all comments and they are very much appreciated. For those of you that didn't, shame on you! Oh and you can click on the title to this post to download the brag book page. thanks for the freebie. I wish it would get cool here in the fall we generally have only 1 1/2 seasons Summer and maybe a couple of weeks of winter! Thanks for visiting my blog! I wish I could say I love camping in the fall--or any other time, but I'm afraid I'm not a tent girl. However, I do love campfires and s'mores, so I hope that gets me back in your good graces, lol! Love your little brag book page. It's a cutie. I love it!! My husband has been promising to take the girls camping when it gets cooler & I'll use this for one of their bragbook pages. Thanks for sharing!